If you've been reading Look What Danny Made! for a while, you may remember way, way back to the second move that I ever watched for Project Horror, The Cabinet of Dr. Caligari. That movie is, of course, a fairly well-known classic, but the way that I first heard of it was in a book about cult movies that I checked out from the library. Tonight's movie was in that same book that I checked out when I was a kid. It's always kind of played in my imagination since then, and tonight I finally checked it out. Let's just say that it was much better in my imagination. 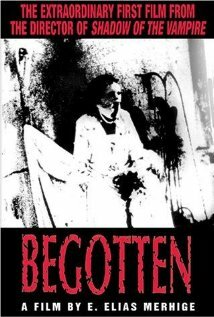 Begotten is kind of a horror film, but very much an experimental film. It's like Un Chien Andalou; it shows very unsettling imagery in a very artistic way. Unfortunately, it's also like five times as long as Un Chien Andalou. It features no spoken language, and is shot in black and white. And when I say black and white, I don't mean like Citizen Kane. I mean that it was shot in some kind of process that makes the images onscreen render only in black and white, with no grays to provide contrast. This, combined with the already bizarre onscreen occurrences, makes it incredibly difficult to tell what's going on for a lot of the movie's running time. To very, very loosely summarize, the movie shows an Old God killing himself. A woman emerges from his remains, pregnant with his son. The son is born a fully grown man, whom she abandons, and who is killed by nomads. But then he resurrects. But then they come back and get his mom and kill her and dismember her. Then they come back again and do the same thing to him. Then some flowers grow over the spot where he was buried. Except there was a lot more gruesome stuff (kind of) shown in the process. I've got to be frank, I hoped to enjoy this film because I like when a movie can show me something new and different, but I honestly just didn't know what was going on for most of this movie's run time. I'd probably still be lost if it wasn't for Wikipedia. I'm glad to have seen it at long last, but this one just wasn't for me. I give Begotten two straight razors out of five.